Our friends Laurel & Kate at Teton Resorts want you to come out and experience these great slopeside properties. What better way than with MULTIPLE discounts! 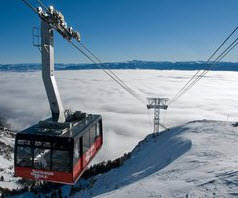 15% off and 5th night FREE at Hotel Terra or 10% off and 6th night FREE at Teton Mountain Lodge! Hotel Terra Jackson Hole offers the exceptional amenities and services expected from boutique hotels, combined with environmentally sustainable building and operating practices. Green practices include Hotel Terra's LEED (Leadership in Energy and Environmental Design) certification, which puts it in an elite group of LEED certified hotels in the United States. Hotel Terra pushes its efforts well beyond LEED criteria and is continually developing efforts to preserve and protect the environment in their operations while still offering an indulgent hotel experience for guests. On-site amenities include heated rooftop pool, fitness center & Chill Spa, breakfast/lunch cafe, Italian restaurant, and ski & snowboard shop. All this, just steps from the new aerial tram. Get a 5th night FREE at Hotel Terra or a 6th night FREE at Teton Mountain Lodge. Yep, on the house, gratis! You can also take an extra 15% off your stay at Hotel Terra and an extra 10% at Teton Mountain Lodge. Wow, their combinable!